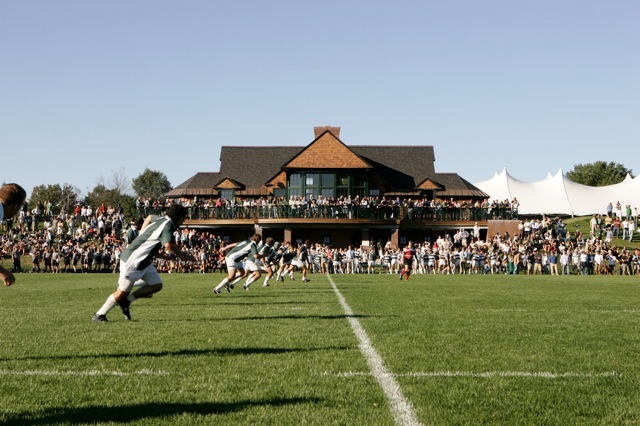 Hanover, NH – This past weekend, the Dartmouth Rugby Club proudly hosted Harvard in the Ivy Championship game. Both teams had been unbeaten in their Ivy rugby match ups, thus setting the stage for a big showdown between the two teams. Both teams fought bravely with Dartmouth ending up the victors, winning by a score of 51 to 19. Coach Hickie kindly offered his season-ending remarks, saying, “We designed our season to hit the ground running once the Ivy Rugby Conference commenced and we continued to work hard each week to build on our individual skills and team processes. The result is our 9th consecutive Ivy Rugby Conference Championship”. Dartmouth were quick to set the pace in the first half with Co-Captain Ryan Maguire ’16 claiming the first points of the game with an explosive burst down the wing after weaving backs’ play created a narrow lane on the outside. Shortly thereafter, Captain Jack Braun ’16 powered through the Harvard defense in the middle of the field as he ran a line that cut against the grain of the play shifting across the field. Other notable first half moments of pleasure for the Big Green came in the form of scoreboard-frequenter John Abraham ’16 and Phil Sheridan ’16. Abraham claimed a hat-trick of tries against Harvard through his characteristic use of his immense speed and evasive skills while Sheridan scored after breaking tackles before diving into the try zone. The second half saw the Big Green slow the rate of scoring as Harvard managed to take advantage of lapses in concentration, scoring three tries throughout the second half. Just before time was called and the Ivy League title was declared Dartmouth’s, Julien Johnson ’18 scored his first 1st XV try on his debut in his first touches of the game as he picked off a pass in the midfield before sprinting under the posts. Coach Hickie continued, “I would like to thank all our alums for your incredible support, our coaching staff for their tireless work and dedication, Ben Schuler, our athletic trainer for taking good care of the boys, Joann Brislin for all her work behind the scenes and the student athletes of the DRFC for making this another highly successful and enjoyable Fall Ivy season.”. With the final whistle of the Harvard game, the Big Green concluded their 2015 Fall season with the Ivy title to their name. The players now have a few months to recover over the winter break before returning to Hanover in January to start their preparation for spring competitions such as the Varsity Cup and the CRCs. The DRFC wishes to thank all followers of the Big Green Rugby Team for their dedication and support throughout the Fall Season.